one happy little crafter: Monochromaticalness!! 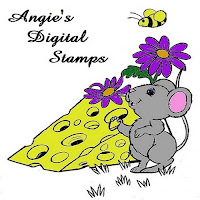 We were lucky enough to be provided with some adorable images from our sponsors for the team to play with, I couldn't resist Daisy Mae from Angie's Digital Stamps. Our DT have made some amazing cards for this challenge, do hop on over for a visit! SO VERY pretty and love the die. Beautiful card and like the die used on the side. What a delightful card Lisa! Lovely image so beautifully coloured in the pastel colours and a wonderful card design. I love the die cut you've used on the side. Thanks for making your gorgeous DT card for our challenge. Love having you part of our team, thanks for all your hard work. Enjoy your weekend. Well done to Megan, and beautiful card Lisa. Adorable card Lisa - such a sweet image and I love that gorgeous floral die cut. Congratulations to your daughter and all the best for her Uni adventures. A Guest DT Spot....and a few Stripes!